Alphonso James went to prison at age 17 for a crime he didn’t commit. After 32 years, he was cleared by a DNA test and returned home to Milwaukee in February 2017. 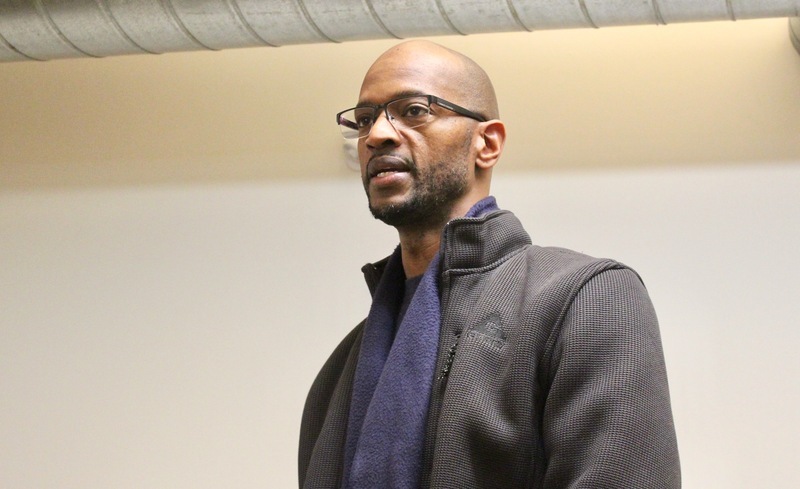 Last week, he stood before about 50 people crowded into a room at the Welford Sanders Historic Lofts & Enterprise Center, 2821 N. Vel R. Phillips Ave., and discussed his experience. 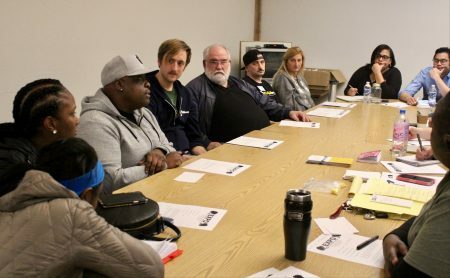 James spoke at a listening session hosted by Ex-Incarcerated People Organizing (EXPO) and prompted by Angela Lang, executive director of Black Leaders Organizing for Community (BLOC), who was recently appointed to Gov. Tony Evers’ Public Safety and Criminal Justice Reform Policy Advisory Council. According to a statement from Evers, the council is tasked with assisting the governor’s administration in exploring reforms of the state’s criminal justice system. The purpose of the session was to provide an opportunity for people with direct experience in the criminal justice system to tell their stories. Evers and Lt. Gov. Mandela Barnes were sworn into office on Jan. 7. Throughout their campaign, they touted their desire for criminal justice reform and called attention to the racial disparities in Wisconsin’s system. According to data from the United States Department of Justice analyzed by the Sentencing Project, Wisconsin incarcerates African-American people at a rate of 10 times higher than their white counterparts. Wonderful team, you have so much public support. Very powerful, moving and insightful article. We are now in the struggle of our lives with trying to get my brother released from jail. He has served almost 25 years, sentenced to 54 at the age of 22……for bank robbery. That’s excessive time… it shows that money is worth more than a person’s life. Ppl who take a life get less time. Even the judge that handed the sentence down was hesitant on the time but had no choice. His hands were tied by law. And the lawyer that represented him at the time admitted not representing him well and although he is retired now he is trying to help in anyway he can to get my brother’s case looked at again, or have time served applied, early release or whatever he may qualify for under this new bill. If you or anyone has any advice, legal or whatever we can use/try please contact me. I have no advice or help but wanted to say KEEP TELLING Your story. All of us. I am a white 42 year old female. What is happening in our prison system is disgusting as a whole-but the fact that a blind eye is being turned on the EPIDEMIC of blacks in our country living in prison makes me ashamed. I’m in the system myself-but it’s different for me-it’s not easy for me because the system is reduculous…but it’s EASIER for me. That’s wrong. Period. This is OUR social problem. WE as a nation, as a city as a community HAVE to raise awareness. I can’t tell you how happy I was to see you on the news today. I truly want to help. To advocate-whatever I can. I can’t vite yet but I will when I can. What can others do? What can I do to get involved. I have a very dear friend who was imprisoned for 6 years and released around his 30th birthday. He got out, got a good paying job and his own place. His probation officer ‘suspected’ he drank-even though the three breathalyzers were ZERO. She gave him an ATR and said he’s Lucky to not be revocated. This IS what happened. He’s requested a new PO and was denied twice. He lost his job, apartment and has been in MSDF since September. For her ‘suspicion’ of him drinking he’s been LOCKED UP SINCE JULY 19, 2018. This is cruel and unusual. Please, I have many more stories and want to help. Jessica, I am Alan Schultz who was mentioned in this article. I am a community organizer with EXPO and I’m on the CLOSEmsdf Core Team trying to get the facility shutdown. If you have access to Facebook you can find me on there under the same name and we can talk further about how you can get more involved or about the level of involvement you’d like to have with us. You can also find more ways of contacting all of us by checking out the WISDOM for Justice website, ROC (Restoring Our Communities) Wisconsin campaign, CLOSEmsdf.org, EXPO FB page, WISDOM FB page, or even stopping by one of our next events that is listed on some of those sites. I’d share my e-mail here but doesn’t seem prudent if there are people trolling or in case that isn’t allowed and would flag this post. I hope to hear from you and please don’t hesitate to send a friend request my way if you are on Facebook. Thanks and take care. I am praying & hoping that Mr. Evers will get rid of Truth In Sentencing & bring back parole. Right now DOC is not correcting anything, they are just having inmates doing “idle time” no programs, denying ERP each & every time one goes to the review committee because they have too much left. The WI prisons are over populated. Even Tommy Thompson said that something needs to change, he was sorry for building prisons when he was Governor. I go see my fiancée regularly & it’s said the way inmates are treated. Has our society become some cruel that it has forgotten that inmates are human beings too??? I pray that something changes right away!! !